29th day of the year. There were then 336 days left in 2019. 40th day of Winter. There were 50 days left till Spring. Anyone trying to ignore the fact that Jussie Smollett is BOTH Black & gay need to sit down. This was a racially-motivated homophobic attack. They called him racial slurs AND homophobic ones. He carries BOTH identities and white supremacists made it a point to target both. 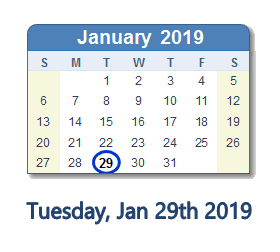 What happened on January 29th 2019?